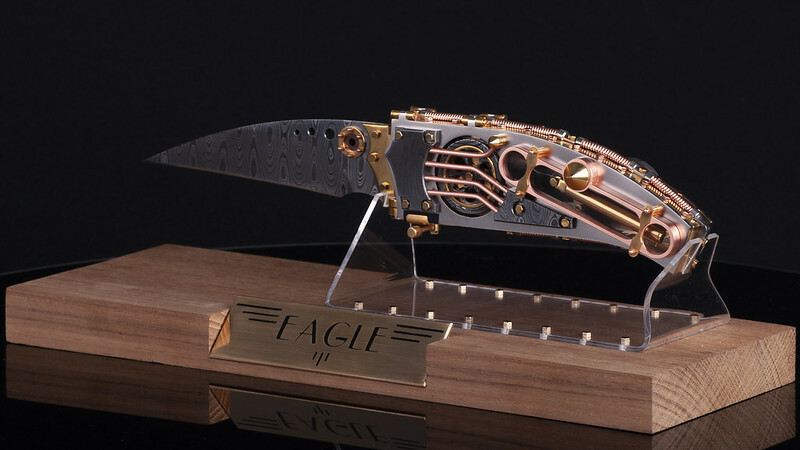 This is the second steampunk folding knife I made. I call this one "Eagle" because you have to open his wings to release the blade. It's a assist opening folding knife. I worked on this one for more than a year at this moment, and it's almost finished. Still have to do some internal parts for the assist opening system. Blade, bolsters and the two wheels are made out of custom made ladder/mosaic damasussteel. The other parts are mostly brass. the yellow parts are gold plated. The silver parts are nickel plated. I also made the mechanical iris (hiding/showing my brand logo). the copper parts are protected with lacquer to prevent patina forming. Last edited by JF-Knives; 07-30-2018 at 07:51 AM. I absolutely love that! I always wanted to make one, but never had the patience. Sooo nice! Looks like a lot of work went into her. Here are some specs. I forgot to mention. 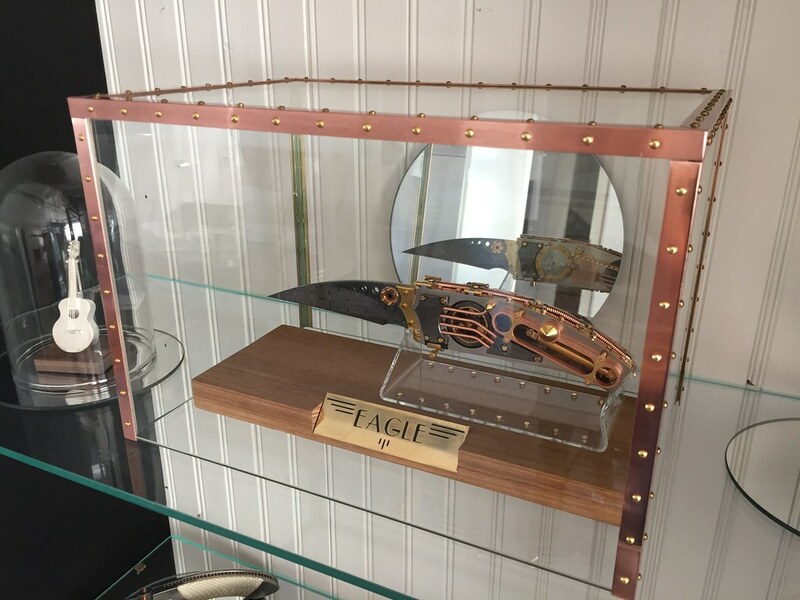 “Eagle” steampunk knife tech specs. 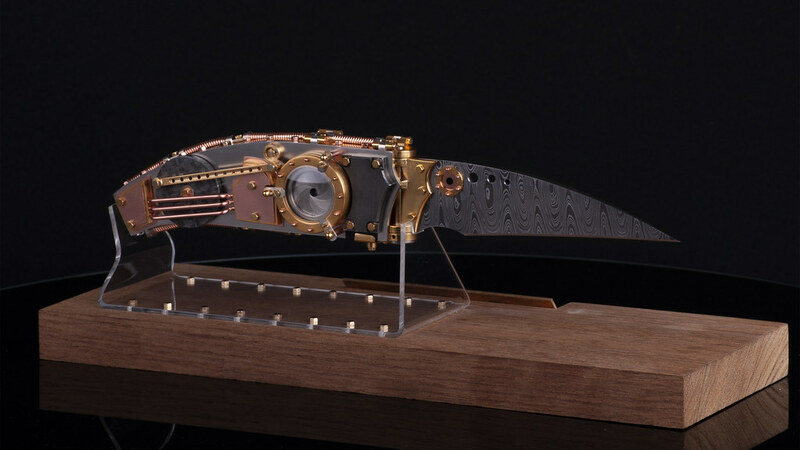 Steampunk style sideways opening folding knife. Total length: 245 mm with blade in open position. All 300+ parts can be replaced. Special thanks to @maartenvanhattem for making the Damascus steel and @karatknives for the Black Coral. Custom made Ladder Damascus steel by @maartenvanhattem 3.25 mm thickness. Heat treated and etched in instant coffee only. Connected to the pivoting mechanism with 6 brass m2 bolts 24k gold plated. Base rings (2) brass 24k gold plated. Eye of massive copper, pupil of South African Black Coral by @karatknives protected with a layer of lacquer. 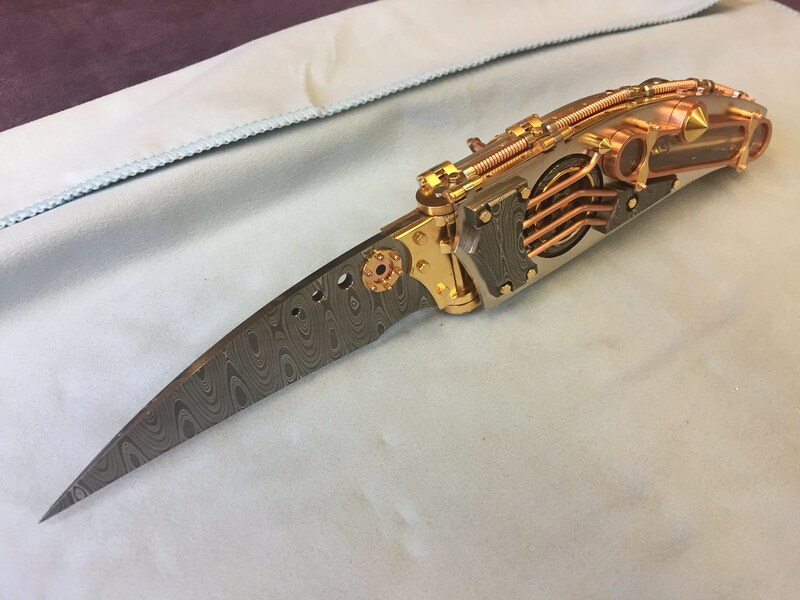 Connected through the blade with 6 m1 threaded rods and 12 m1 brass cap nuts copper plated and protected with a layer of lacquer. Brass base silver soldered 24k gold plated. On the spine 22 m2 bolts copper plated protected with a layer of lacquer. 7 copper spirals connected to the frame with nickel plated brass connectors and m2 24k gold plated brass bolts. 24k gold plated brass wing release/lock mechanism. This wheel is part of the assist opening system of the blade. Custom made Ladder Damascus steel by @maartenvanhattem 3.25 mm thickness, connected to the frame with a m2 24k gold plated brass bolt. Inside the wheel a brass ring 24k gold plated. This piston is part of the assist opening system of the blade. Made out of brass tube with a stainless steel base rod and a mechanical spring. All the brass is 24k gold plated. this piston is connected to the blade with a 0.5mm covered with plastic steel cable. Base material 2mm brass nickel plated. The Damascus steel bolsters are Custom made Ladder Damascus steel by @maartenvanhattem 3.25 mm thickness heat treated and etched in instant coffee only and connected to the base with 24k gold plated brass bolts . All the copper parts are protected with a layer of lacquer. The piston cover house window is 1mm thick real glass. All the other yellow parts are brass 24k gold plated. Base material 2mm brass nickel plated. The Damascus steel bolster is Custom made Ladder Damascus steel by @maartenvanhattem 3.25 mm thickness heat treated and etched in instant coffee only and connected to the base with 24k gold plated brass bolts. heat treated and etched in instant coffee only and connected to the base with 24k gold plated brass bolt. 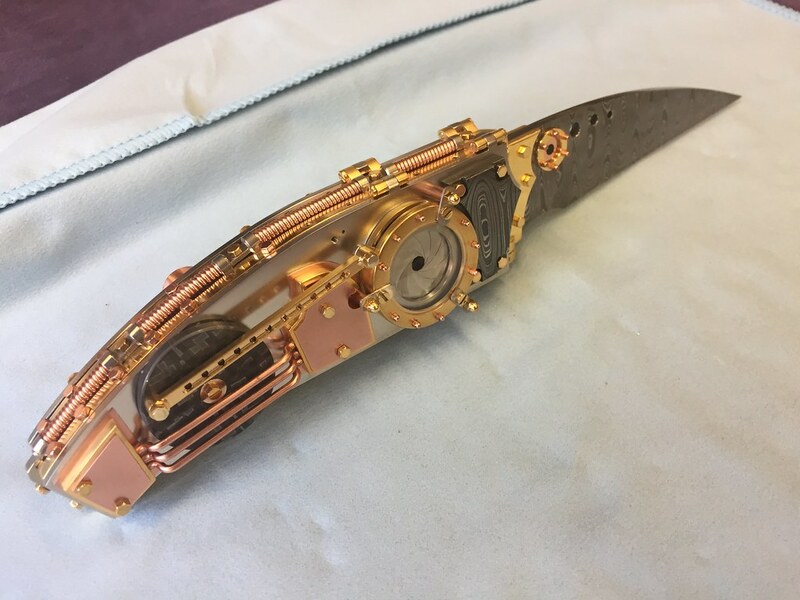 This wheel is part of the opening system for the mechanical iris and is connected to the mechanical iris through a 24k gold plated brass drive rod and bolts. Outside diameter 27mm and 7mm thick. Base material 24k gold plated brass. 10 leafs made out 0.1mm brass nickel plated. 9 copper plated brass m1 cap nuts protected with a layer of lacquer. Leafs are covered with a 0.9mm thick real curved glass. Mechanical iris is connected to the base of the wing with gold plated brass m2 screws and copper tubes. All the other yellow parts are brass 24k gold plated. All the other copper parts are protected with a layer of lacquer. Teak wood base. 24k gold plated brass name plate. Perspex stand connected to the base wood with 16 24k gold plated brass m2 bolts. Last edited by JF-Knives; 08-22-2018 at 08:34 AM. As a folder builder, I can’t even wrap my mind around a build that would take 400 hours! My hats off to you! ​Thank you all for the nice comments.